My card is a Christmas one made some time ago and never blogged as I am still trying to get back into crafting. Please take a look at the challenge blog for some lovely creations by the Design Team. A very striking card Pat, love that postbox die and the embossed background is lovely. This is really gorgeous! So effective with that fab postbox Die! Love the sparkle on top too! I love this snowflake embossed background and that fab postbox die makes a real statement - it's a great Christmas card, Pat. I've enjoyed the sunshine for the past few days - painting and gardening - hope it's nice for you too. Beautiful card Pat, fabulous postbox die. A fabulous card Pat, a lovely embossed background and super die cut postbox - a striking CAS design. 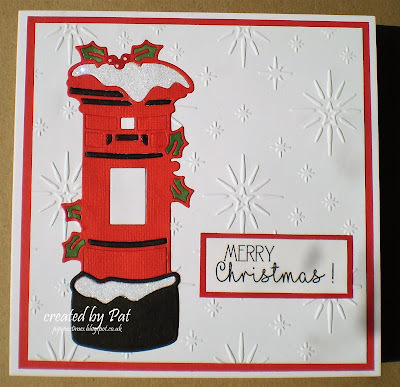 I love everything about your card Pat - from the embossed background to the bright red and black post box. Love it!